Click here for Alex’s blog post about the health benefits of watermelon! Place quinoa into a sieve and rinse with cold water for 20-30 seconds. Put your rinsed quinoa into a pot with 1 cup of Vegetable stock and 1 cup of filtered water, cover and bring to a boil. Reduce heat to low-medium, remove lid and simmer, stirring occasionally. To make dressing: in a large medium sized bowl, whisk together olive oil, coconut vinegar, shallots, chopped basil, honey, lime juice, salt, and pepper. In a small frying pay, toast your pine nuts on low-medium heat. Keep a close eye on them as the burn quickly! Move the frying pan back and forth to disperse the heat evenly. Warm until light golden brown. When quinoa is finished (all water has been absorbed), remove it from the heat and stir it with a fork. Scoop ½ cup of quinoa into a bowl (you will have plenty extra for leftovers! 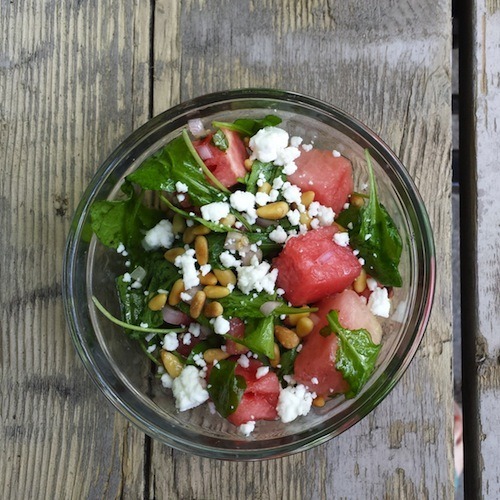 ), add watermelon & arugula mix, and top with toasted Pinenuts and sheep’s feta crumble.